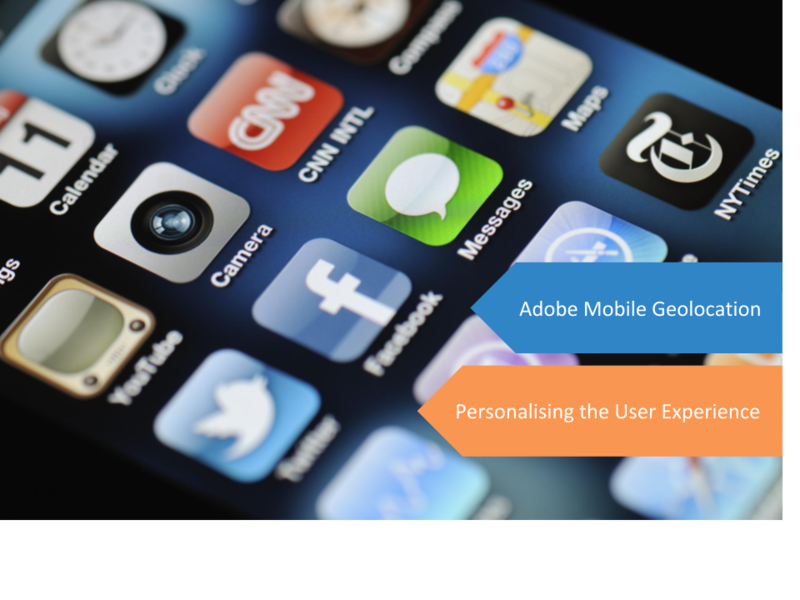 Mobile apps, particularly Adobe Mobile Services enabled apps, offer an unprecedented ability to achieve these goals. Mobile Geolocation now enables marketers to build fences around locations that can give insights, such as; ‘how many customers opened our app at this sports game to research players’, ‘who opened the app at their destination after travelling with us’ or ‘who went to our store in a shopping centre after seeing a deal on our app’. We can then use these insights to deliver customised marketing, optimised apps and build audience segments. But first, what is Geolocation in Adobe? What is Adobe Mobile Services Geolocation? All smartphones contain Global Positioning Systems (GPS). Adobe Mobile Services enables developers to hook into this feature and capture a user’s near exact location when a user completes an action or opens the app. This information can then be pushed to Adobe Analytics to allow the analyst to get an idea of the location where the app is being used. The value of this feature is in its ability to identify that a user has opened the app at a specific location of value to the business, such as a store, a sports field, a shopping centre, an airport or concert venue. These locations are called Points of Interest (POI) by Adobe. A POI is defined in the Adobe Mobile Services interface as a set of GPS coordinates with a defined radius which is an estimate of the size of the POI from its centre. Adobe provides the following example and future details on POIs in their Adobe Experience Cloud Help files. How Can My Company Use This Information? A customer uses an app to book transport between two destinations. Marketers in control of the budget for content want to know if these users reengage with the app while at their destination to determine whether it is worth creating more content about the destination. This can be done by linking POIs and Geolocation data to Adobe Analytics. Point of Interest data tells us a loyal customer is within 2km of a store during a sale. We can customise the loyal customer’s home screen to feature the sale and prxovide directions to the store. This can be done by linking POI and Geolocation data to Adobe Target. A customer has opened the app at the destination airport after a flight. By linking POI and Geolocation data to Adobe Target, we can customise the home screen to show directions to transfers or the lounge. Want to know more Adobe Mobile Analytics? Lens10 is Adobe Analytics and Google Partner with commercial experience delivering mobile app solution designs and supporting implementation for enterprise level clients. To discuss how we can add value to your Adobe Mobile Analytics implementation, contact us for a conversation.